So, you know I am into food flavors and flavor combinations, the balance, the taste, the herbs, the freshness, the delight in tasting something and going, Oooooooom! You should know that I love watching the cooking shows - mainly for new ideas, different techniques, other food cultures, etc., and how I came across Chimichurri. While I imagine most cultures have some form of it, I sought an authentic preparation from Argentina, of course, with my own personal tweaks! Well, because, it just goes with almost everything, savory! A finishing touch to any dish, I make a batch weekly to keep in the fridge for me and Grannie to boost the flavor of anything from prepared dishes of meats, pasta, vegetables to a sandwich spread. 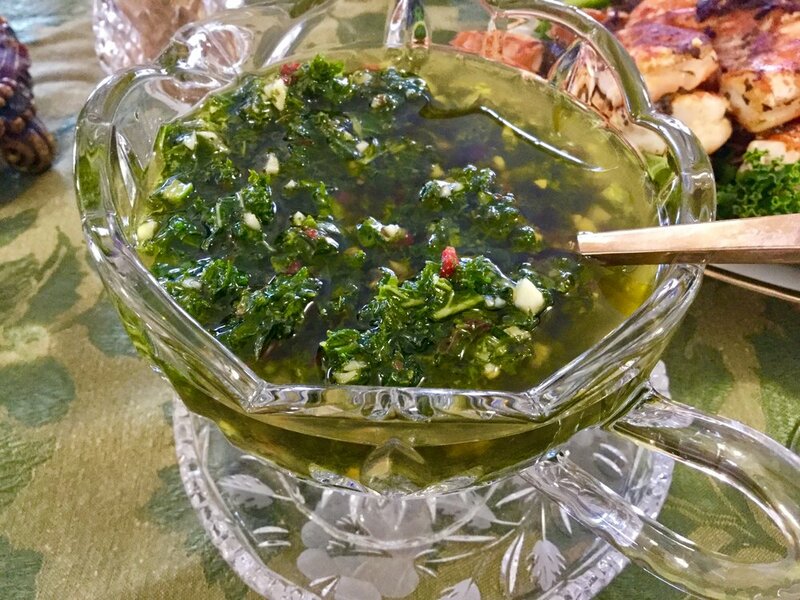 Chimichurri is an oil-based salsa, essentially made with Parsley, Oregano, Garlic, Red Hot Peppers, Olive Oil & Red Wine Vinegar, used most often as a marinade and/or finisher of grilled meats, poultry and fish. Though, again, I find that it goes with just so many things. I also found that, well, sometimes I just don't have fresh parsley, so, I use whatever fresh greens I have on hand and for me, that would be Kale. Note that I sometimes like to add finely chopped onions, some lemon pulp and a dash of honey, or whatever comes to mind to try and, that's it! Just mix it all up in bowl; refrigerate and well, try it on just anything savory! The finisher for so many dishes!